Proper home insulation and attic ventilation are a balancing act. It takes an expert to install the right amount of insulation and roof vents to prevent ice damming and give you the best energy savings, comfort, and air quality year-round. Twin Pines will carefully inspect your roof and attic and discuss recommendations in detail. Once your home is in balance, your attic ventilation will reduce the difference in temperature between your attic air and the air outside, giving you more energy efficiency, less moisture, and a longer life for your roof. According to NAIMA, 90 percent of homes in the United States are under-insulated. In Wisconsin’s climate, where temperatures range from below zero to triple digits and humid, having the correct amount of attic insulation is crucial to avoid problems and maintain comfortable temperatures in your home without wasting energy. Wisconsin is a zone 6 state that needs R-49 to R-60 insulation in the attic, 16 to 18 inches deep. Twin Pines is pleased to offer AttiCat Fiberglass Insulation from Owens Corning. This blown-in insulation system expands the pink Fiberglas insulation inside the blowing machine and makes for a simple, low-dust installation process. The best part is that the insulation won’t settle over time but will keep its high energy-saving R-value. We also install the PROPINK L77 Loosefill Insulation from Owens Corning, a dense insulation for attics, walls, floors, and cathedral ceilings that reduces noise penetration and energy consumption with the highest R-value per inch. 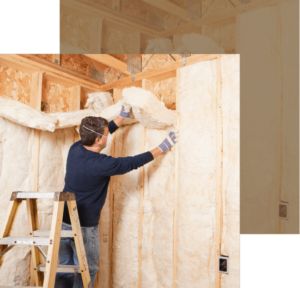 This insulation has no harmful chemicals and is non-combustible, non-corrosive, moisture-resistant, and made from at least 50 percent recycled content. Soffit vents are at the bottom of the roof, by the eave. Ridge vents are at the peak of a sloped roof. The combination of soffit vents and ridge vents provides ideal air circulation and helps control attic temperatures. Twin Pines is Mequon’s go-to company for inspecting roofs and attics and installing vents and insulation. Contact us to set up your inspection.